Deal of the Year and Giveaway! I'm thrilled to offer you all the chance to win an Ultimate Healthy Living Bundle! The Ultimate Healthy Living Bundle is in the middle of its sale right now. Just a few more days left and then it's gone forever. You don't want to miss out! Today I'd like to help three of you readers on your healthy journey! This giveaway will close at 11:59pm EST, September 13, 2014. So, what is the Healthy Living Bundle? It's over $1000 worth of Healthy Living Tools for just $29.97!! This bundle is not just e-books, though there are over 70 of them included, including my own cookbook Whole Foods for the Everyday Cook. Also included in this $29.97 bundle are seven e-courses you can take: from learning about essential oils to managing your real foods kitchen. Not only that, but there are some free items included too! Now, if you're like me, you may immediately think—okay, what's the catch? Are they REALLY free? Well, here's the scoop. You do have to pay shipping fees for most items (two don't require shipping), but all are quite minimal fees. The companies offering the bonuses have not spiked their shipping fee to cover costs; but rather these fees are the normal shipping fees you would pay if purchasing from them. That's good news! If you redeemed every item (worth $208 total), the combined shipping—or out of pocket for you—would be around $40. As you can see in the graphic above, you will receive a total of $200+ worth of products for just the roughly $40 in shipping fees. If you were purchasing the items, you would actually pay about $240, because you'd pay the same shipping fees. But by purchasing the bundle, you will pay only the ~$40 fees. That's the equivalent of about an 85% off sale! However, to get best deal from purchasing the bundle, consider each free item offered and decide whether it's worth that cost to you. Even if you pay $3 for an item, if it's not something you need or will use, it's not a good deal for you. After doing some thinking, prioritizing, and more thinking, I have decided to make a big change in my blogging life. 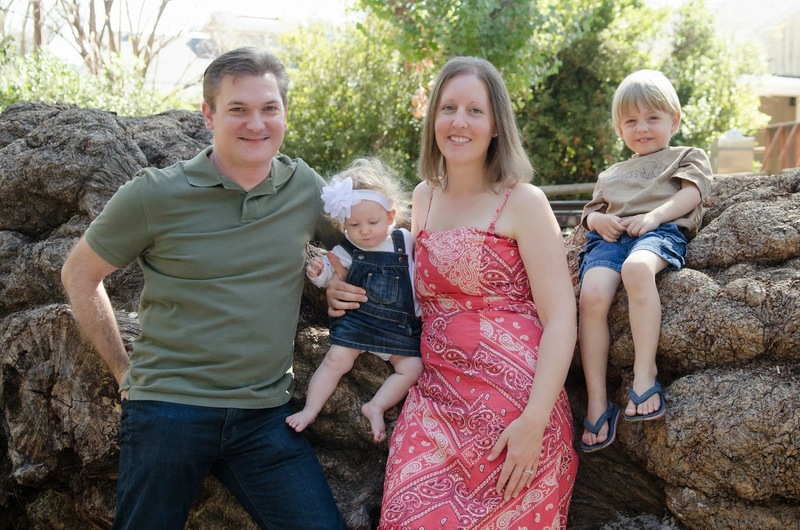 Life has just become so busy, raising a family, going to two schools, teaching classes, writing books (yes, more books to follow our first release, Whole Foods For the Everyday Cook), and keeping up with all my cooking projects, that I just do not have the time to keep up a full time blog. So, I am transitioning, and will be a contributing writer for my sister's blog, Whole Foods on a Budget. While I am a bit sad not to be able to keep up my blog, I know that this transition is really for the best and I am looking forward to contributing to her blog, and bringing all of you over for some great reads by the two of us!! Thank you to all who have read and commented on this blog and I do hope that you will follow me over to Whole Foods on a Budget, where a variety of Healthy Living topics will be addressed. I will keep you all posted as to when that transition will take place (probably first post up in October). Now, on to BIG announcement number 2!! My sister and I have been invited to participate in The Ultimate Healthy Living Bundle, coming soon! Do you need help in order to eat more healthfully? Live more naturally? Would you like samples of free products that help you live a more natural, healthy lifestyle? Or books and resources to assist you in your quest? And would you like it all for FREE? Well, get ready—a fabulous bundle is headed your way! I'm delighted to share today that my cookbook Whole Foods for the Everyday Cook will be included in the Ultimate Healthy Living Bundle. The bundle will contain a whole host of e-books, as well as e-courses and free natural food and living products—over $1000 worth of products—all for one awesome low price. A really exciting feature of this upcoming bundle is that YOU have the opportunity to get it all for FREE by helping us spread the word! Sign up here (all you have to enter is your email address), and you will be notified once the Ultimate Healthy Living Bundle goes on sale. You will also receive a link that you can share with your friends. 2. Refer 5 friends and you'll get a free 12-session audio e-course. 3. Refer 10 friends and YOU GET THE BUNDLE FREE. I think you're really going to like this bundle. It's full of cookbooks geared around whole foods and allergy-free foods; there are resources for learning to live more naturally, from yoga to using essential oils; and there are truly some awesome free products included. The other morning I was changing my one year old's cloth diaper and noticed an angry red area about the size of a penny that had a small scratch in the middle of it on her little bottom. It was slightly raised and though there was no white head, it did not look very nice. I immediately decided to try a drawing poultice to help heal the area and get rid of any possible infection that might be occurring. I keep a lot of herbs on hand and it's times like these that I am grateful for the wide variety of herbs in my pantry. There are a number of herbs that can be used for this purpose, but these are the ones that I happened to have on hand. This is approximately the recipe I made, as I was in a hurry and did not have time to do specific measurements. Three hours later, the area completely down and there was just a trace of redness around the scratch. I removed the bandaide, cleaned the area and applied a drop of tea tree oil. Amazing the power of herbs!! I did apply another drop or two of tea tree oil during the day and then at night placed a little of the paste on a cotton ball and placed that over the scratch. I have also used this paste on my husband when he has had infected ingrown hairs with great success. Disclaimer: Please do not misconstrue this as medical advise. With any medical condition, please seek the help of a physician with any medical questions or concerns that you might have. I am not a physician, nor do I give medical advise, diagnose, or treat medical conditions. My Cookbook is on Sale! Wow! Time is flying by and I know that this blog has been a bit neglected. Life is just so full and busy these days. I have very exciting news, though! After three years of work, my sister, Christy, at Whole Foods on a Budget, and myself have released our first cookbook - Whole Foods for the Everyday Cook. We are so excited to share these fabulous recipes with our readers. Written by two busy mommies, these recipes are perfect helping you to daily get whole foods into you and your family. Head over HERE to read more about the book and find out where to buy your copy. I love finding new heirloom varieties of fruits and veggies. These are some gorgeous carrots that our local grocery store has started to sell. My picture does not do them justice. My four year old loves eating these colorful carrots - it makes meal time much more fun. What are some of your favorite heirlooms? Time is just flying! Life is full and busy, with school, children, cooking, and starting up my new business, you can see HERE. Right now a lot of our "spring" produce is coming in, including strawberries (filled my dehydrator with about 20 or so pints the other day! ), blueberries, and lots of yummy veggies. I have made a lot of cultured veggies in the past week, and yesterday, I made this one with some radishes, and romanesco that came in our co-op the week. I love the colors. It was very easy to make, and probiotic rich. 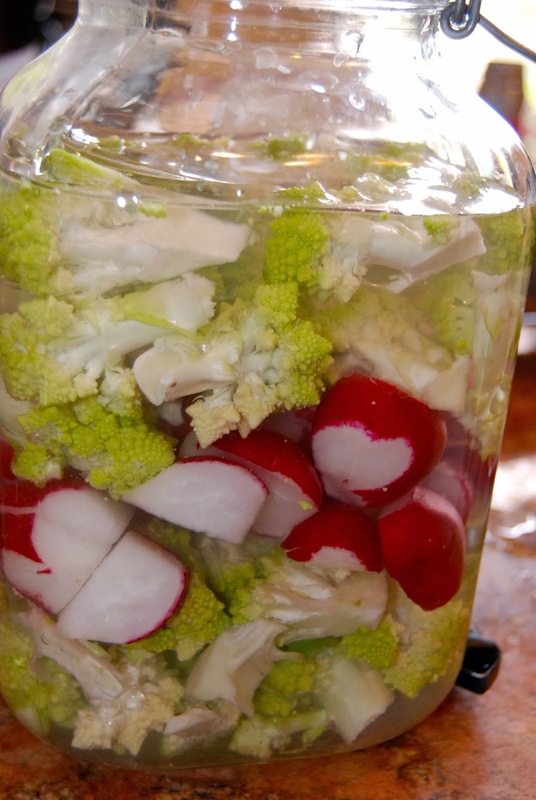 I used a 3L pickl-it jar and had two small head of romanesco and about 12 large radishes. I broke the romanesco into small pieces and cut the radishes in quarters since they were so large. I used a brine with a ratio of 19g salt to 4 cups of water. This will sit in our pantry for 4-5 or until it stops bubbling. I can't wait to try these. My 4 year old really likes "radish pickles." Thanks for hanging in there with me, as life is so busy for me these days! I hope everyone is having a great start to their New Year! We had a lovely Christmas and New Years and a little bump to our start of the new year with my four year old coming down with a stomach bug. Thankfully, it seems to have bypassed the rest of us and it was a very quick stomach virus. As always, I learned something new as I was helping my little guy. This bug presented with a sore throat, fever, and then the vomiting. Thankfully, the fever only lasted about 10 hours and never went over 102. As I have discussed before, a fever is often a good sign that the body is fighting off a bug, so as parents, we want to keep an eye on it, but not try to reduce it right away. It's good to support the body through the fever if it's not getting too high. Lowering the fever right away using tylenol often hurts the body, not allowing it to kill off the bacteria and can sometime account for repeat illness or infections. Since my son's fever was not getting too high, I worked to support his body with fluids like coconut water, elder flower and spearmint tea, and cool water. I also learned from my friend, Lydia, at Divine Health, From the Inside Out, about using apple cider vinegar to help support and reduce fever. I used this when the fever reached 102. 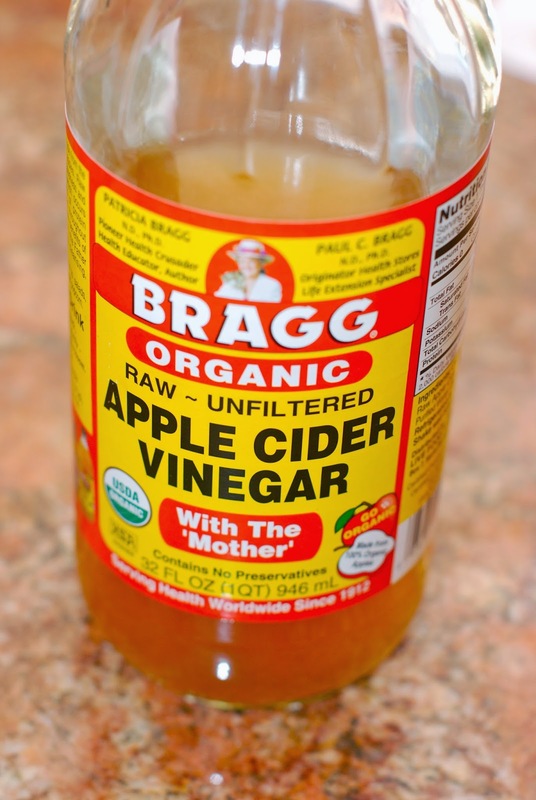 We always have a supply of apple cider vinegar in our home and I always seem to find another amazing use for it! Always learning something new!! I hope you all find this helpful as you care for your family through this cold and flu season. Affiliate link used below. Thank you for your support! Today I want to give you a sneak-peek at the print copy of our cookbook, which is due out very shortly. We can't wait to give you all those details, so be watching for the release right after Thanksgiving! I'm sharing a simple–but delicious–recipe perfect for fall and winter. Coconut Maple Carrots. 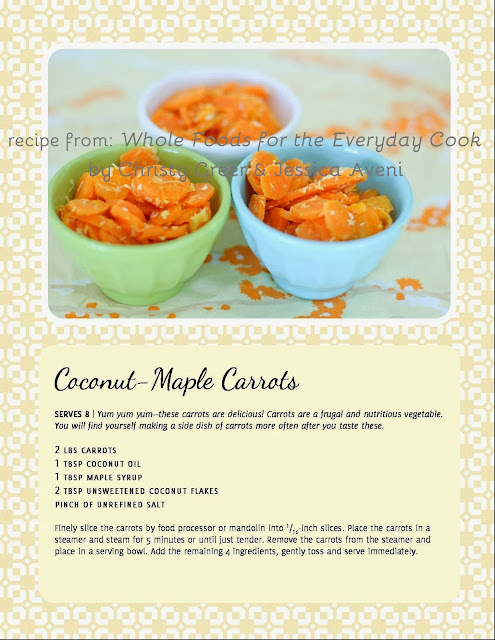 I hope you enjoy this recipe from our new cookbook: Whole Foods for the Everyday Cook written by myself and my sister, Christy Greer, over at Whole Foods On A Budget. Take a peek at her amazing blog!! She is the one who has done all the design and format work (as well as many of the recipes!) in our book. SERVES 8 | Yum yum yum—these carrots are delicious! Carrots are a frugal and nutritious vegetable. You will find yourself making a side dish of carrots more often after you taste these. Finely slice the carrots by food processor or mandolin to 1/16-inch. Place the carrots in a steamer and steam for 5 minutes or until just tender. Remove the carrots from the steamer and place in a serving bowl. Add the remaining 4 ingredients, gently toss and serve immediately. 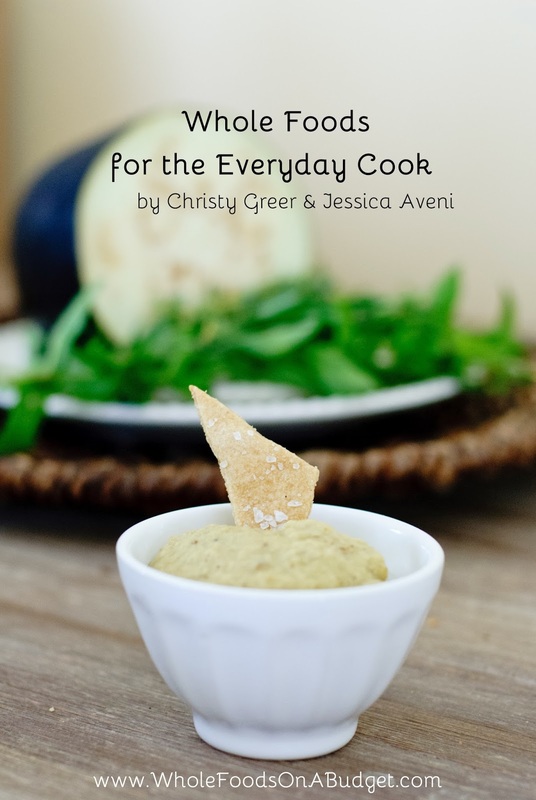 My sister and I are doing another giveaway to celebrate the release of our new cookbook! Please check it out HERE on my sister's blog, Whole Foods On A Budget! Before I share our next giveaway, I'd like to share a short portion of the preface in our cookbook, because it explains why we wrote this cookbook. ...[and so] we landed upon the idea behind this cookbook. A diet based on whole foods is a solid middle ground, a stepping stone if you will, from a standard American diet to other healthier, beneficial diets. Whole Foods for the Everyday Cook is a cookbook designed to make it easy for anyone to transition to a whole foods diet. Furthermore, we wanted our cookbook to be not just for the newbie but also for those already familiar with whole foods. We wanted to create a resource for them too—a resource meant to bring fresh inspiration and new recipes into the kitchen. Thus our recipes span from simple to more advanced. So if you're looking to eat more whole foods, eat more vegetables or whole grains, cook from scratch more, transition to a traditional food/real food diet, or if you already do some or all of these and you simply want some fresh inspiration, then you will very likely enjoy and appreciate our cookbook. With over 100 recipes, you're sure to find some new favorites! Julia Child's My Life in France focuses on a portion of her life, mostly when she was overseas in France. It was there that she took up cooking, began teaching cooking classes, and then began writing her first amazing cooking resource. We have enjoyed reading about her love of fresh, quality, whole foods. And we've enjoyed cooking some of her recipes and learning skills from her. We even found ourselves relating to her a bit (though on a much smaller scale) as we were emailing and calling back and forth across the country working on our cookbook. As she wrote her first cookbook, she corresponded often with Avis de Voto back in the USA, and manuscripts and ideas went back and forth over years. (In fact, I'm reading this book right now.) My Life in France was the book used as the basis for Julia's life in the movie Julie & Julia. If you love France, if you love good food, if you love cooking or Julia Child herself, you will thoroughly enjoy this book! The other book we're giving away is Under the Tuscan Sun by France Mayes. This is a beautiful, inspiring story about a woman who buys a house in Italy to stay during the summers when she is not teaching as a professor. She chronicles fixing it up, but intersperses it with stories of daily life in Italy, gardening, harvesting olives, cooking fresh recipes and more. It is truly a relaxing, delightful read that will make you want to sell your home and move straight to Tuscany! Tuscany holds a special place in my heart after visiting there, and this book sealed the deal for me. If you love Italy, fresh eating, gardening, different cultures, the dying art of old ways, cooking or good wine, you'll love this book. It has inspired us to garden and cook and write about it! To enter to win BOTH books (lucky you! ), please share either this post or about our new cookbook on Facebook or Twitter, and comment below to tell us you did. You can enter twice—once for a Facebook Share, once for a Twitter share. Giveaway ends 11:59pm EST, Sunday, 11/17/13. This contest is only open to those living in the USA. 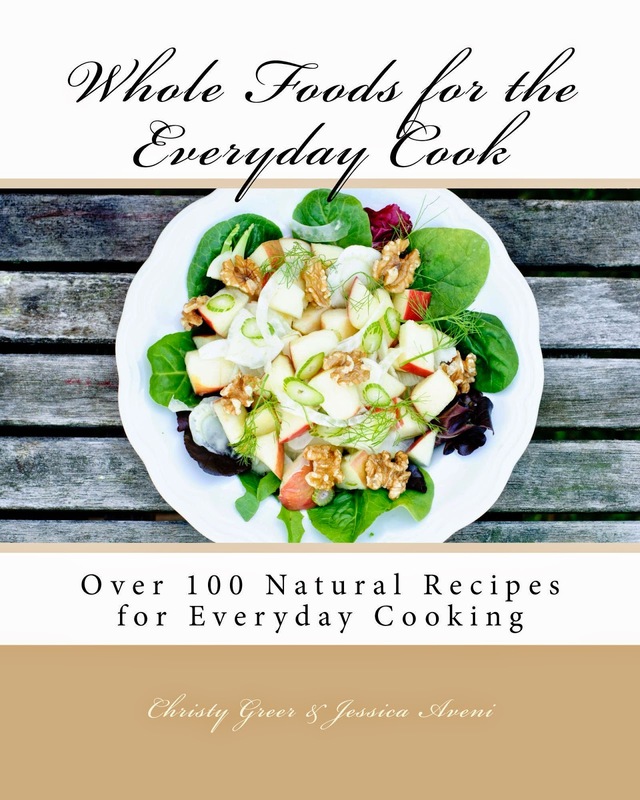 My cookbook, Whole Foods for the Everyday Cook, is now available on amazon (my affiliate), in the Kindle format (hardcopy to follow in a few weeks). To celebrate it's release, my sister and co-author, are giving away TWO FREE copies of our Kindle version today. Even if you do not own a Kindle, you can still read a copy of our book (more explanation on her blog). To enter the giveaway, please go HERE, to her blog, where you can enter. The contest ends tonight, so be sure to get over there today for your chance to win a free copy! So what's in our cookbook? - Over 100 recipes with colorful, professional photos. - Sections on Breakfast, Baked Goods, Vegetables, Grains, Beans-Lentils, Meats-Eggs-Fish, Desserts, Kids, Condiments. - Information on whole grains and how to cook and bake effectively with them. - An introduction to beans and lentils, cooking methods and troubleshooting tips. - Appendices explaining whole foods ingredients; what to stock in your pantry, refrigerators and freezer; and our most efficient, effective and favorite kitchen appliances and tools. 1. Your personality is one of efficiency and productivity. 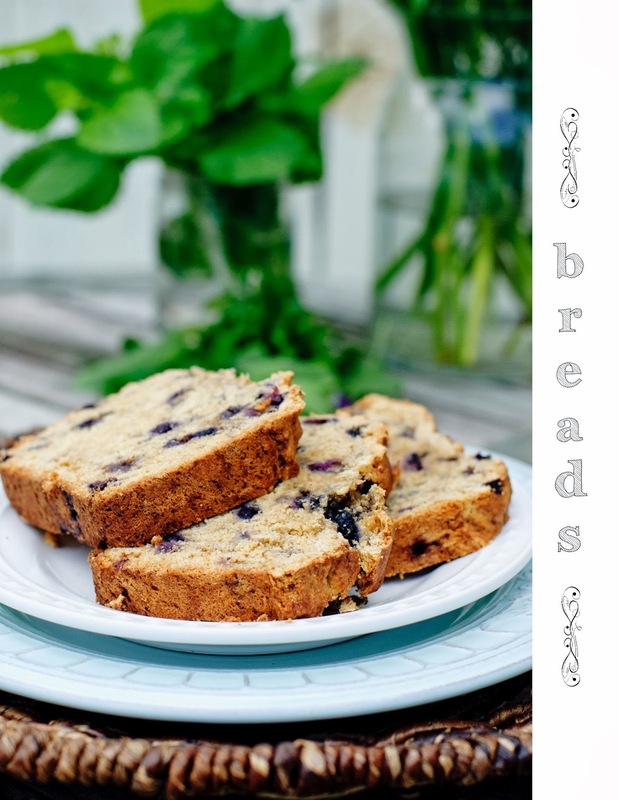 The e-book has links throughout that send you to other recipes or resources with just a click. For instance, if we mention that one recipe is good with another, just click the link and it takes you right to the other recipe. From the "Table of Contents," with just a click, you can go straight to any recipe. 2. You're a minimalist. No book taking up space in your kitchen; just another title on your Kindle or E-Reader. The e-book is a crisp, clean copy—just clear text and photos. 3. You love your Kindle. Here's another book to enjoy on it! 4. The Kindle version is cheaper due to it's virtual nature—no printing costs, no shipping, etc. 1. You are visual and you are inspired by what you see. The print copy is gorgeous—with backgrounds behind every recipe and photograph and unique fonts that enhance the artistic quality of the cookbook. 2. You want a cookbook to keep in your kitchen; one you can flip through, peruse and be inspired by. 3. You still like physical books in your hands. Here's one we hope you will love, enjoy and use often! We hope the pages grow floury and crinkly from regular, loving use. Such are my favorite cookbooks. And of course, who's to say you can only own one version. You're always welcome to buy both!